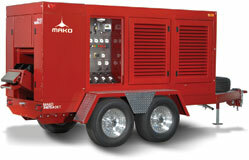 Trailer enclosures are made of welded 11 gauge steel, and the chassis frame is welded structural steel C-channel. Engine vibration is dampened with shock absorbing rubber mounts. Electric activated brakes are standard. The units are equipped with two ASME air storage cylinders for ample air storage capacity. A containment fill station for two SCBA cylinders with fill whips and adapters, and storage cabinet for up to ten SCBA cylinders are also standard.